Sometimes your favorite TV show changes characters or course, and completely ruins them for you. Oh I know, MASH was just as good or even better when Potter replaced Henry Blake, or when Honeycutt replaced Trapper, but that was the exception..not the rule. I've long followed the tumultuous ride that is Scrubs on television. I have seen at least 95% of the episodes going back 8 years. I honestly can only say this with a couple other TV series including Married with Children and Little House on the Prairie. Scrubs started on NBC many years ago, and received ratings that would qualify it as a hit. And man was it funny. Unfortunately, NBC kept moving the show around to different nights and different times. The ratings continued to drop, and NBC finally sold the show to ABC. 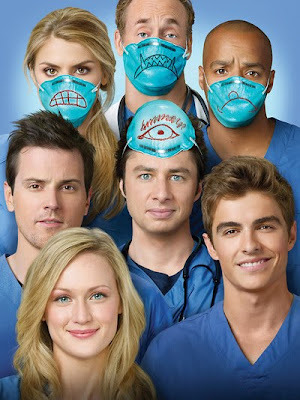 ABC tried for a couple years to "redo" the image of Scrubs, but to be honest...the show was just not as funny. The most recent season (8) there were multiple episodes where main characters were not seen at all. The quirky "dream sequences" were sparse, and you could tell the show was on its farewell tour. It ended quite nice with JD quitting Sacred Heart, and all was well. All was well.....until ABC decided they wanted to bring Scrubs back for another year. The problem was that JD, Carla, and Lawrence (the creator) were all quitting the show. Because of these people quitting, ABC decided to turn the train on tracks that only go straight...I smell a something derailing, and a bloody mess. The new season of Scrubs takes place a year or so after the "finale." There is a new Sacred Heart Hospital, where Turk, Dr. Cox, and JD are all teachers at a Medical School. They have brought in a whole new crop of med school students who spend time learning in the class and the hospital. Scenes with the "old-time" regulars are still funny, but the ones with the new students are....lacking. It's like the show is trying to hard to keep its funny groove on. Even further, JD is only slated to be in 6 episodes, while Dr. Reed will only be in limited episodes. The only regulars slated to remain are Dr. Turk and Dr. Cox. That is like eating a Big Mac without the secret sauce. Like watching the Fast and the Furious without Vin Diesel. (oh wait...that happened) Like going to Disneyland when half the rides are closed. To be fair, the season is only 2 episodes old. Perhaps it will be much funnier, or the new main characters will "grow" on me. Unfortunately, right now it feels like I hadn't seen my good friend for a couple years, and then run across him at the mall. He reluctantly tells of his short prison stint and 4 illegitamate kids scattered across the country. He then asks for money He's still your friend, just...different. 2 chuckle-worthy stars out of 5. I border on 3 stars, but the lack of good janitor/JD scenes was disappointing. This show is not worthy of the title Scrubs...and should be renamed. Many things made me sad about the new scrubs. First of all, JD has become a caricature of himself. He's all over the place. They did sorta rename it. Right after the title screen of Scrubs it says "Med School." Should we look at this as a spinoff? Like a Baywatch Nights? Maybe we can expect a Scrubs:Special Victims Unit. 100% agree about JD. In fact, almost all the characters are stereotypes of themselves. 2 vaguely gay references between Turk and JD. Dr. Cox calling people by wrong names. Dr. Cox walking away after becoming too upset to speak.